Beautiful Communitysubmitted by Michelle S. - Jul 13, 2017 |Recommended: YesI have been here for about three years not once have I had any issues or complaints, anytime I had a maintenance issue of any sort the Maintenance guy Anthony was always here to help and fix the issue. Where I live their is barely any noise and the neighbors are very polite. Thank you for the great and nice service you guys provide. response from property - Aug 29, 2017 Thank you so much for your feedback, Michelle. We are glad you love it here! Great livingsubmitted by Daniel A. - May 26, 2017 |Recommended: YesRenewing my lease. I love it here. Apartments have nice curb appeal, kitchens and master bath bedroom is spacious.submitted by Chad C. - Feb 27, 2017 |Recommended: YesStaff is friendly and helpful, grounds are well kept, apartments are better than the competition although the rent is a little high. It's a great property with very beautiful apartmentssubmitted by Denis J. - Feb 18, 2017 |Recommended: YesIt is a great place to live the staff is very friendly and helpful. response from property - Mar 03, 2017 Wow! Thank you so much, Denis, for taking the time to leave us a 5 star review! Quiet, Well-Kept, Affordable Apartmentssubmitted by Kayla B. - Dec 22, 2016 |Recommended: YesThe apartments are simple and brand new - very well taken care of. The grounds always have neatly trimmed grass and the clubhouse always looks gorgeous. The staff are knowledgeable and friendly and clearly take pride in maintaining this community. Extremely centrally located too - not too far from downtown but close to shopping, dining, etc. Love going for runs around the area too. Everyone I've met has been kind and friendly and it's been a wonderful experience. Excellent Placesubmitted by Jesus F. - Oct 01, 2016 |Recommended: YesThis is a great place for living. Love the property, but thin wallssubmitted by Alexandria N. - Sep 23, 2016 |Recommended: YesWe've been pleasantly surprised by everything at big oaks. Our only complaint is that we can hear everything our neighbors do, and sometimes what they say. Friendly, helpful staff. Clean apartmentssubmitted by Jessica S. - Jul 07, 2016 |Recommended: YesOverall great place to live, some kids are too loud too late near our building but the rest of the complex doesn't appear to have the same issue. Pool and grounds are kept clean, staff is responsive and friendly. I think it's a beautiful community and the staff is friendly.submitted by Marie L. - Jun 14, 2016 |Recommended: YesA friend I work with asked what's it like to live here. I told her that I feel safer living here than I did at my previous complex. I think it's a great place to live. I've had a few maintenance things light bulbs, batteries for smoke detectors and I was impressed how quickly they were taken care of. Apartment Lifesubmitted by Shayna J. - May 31, 2016 |Recommended: YesThis is a very nice apartment place. The staff here are helpful and professional. The parking is decent. We rarely hear our neighbor's unless there are kids out playing but that's to be expected, they are kids after all. The appearance of the community is very well kept. The apartment buildings are always looking clean and well taken care of. The maintenance people are always willing to fix whatever is wrong with your apartment. 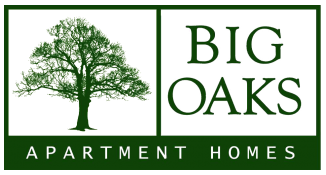 I really liked living at Big Oaks Apartmentssubmitted by Ann M. - May 01, 2016 |Recommended: YesThe Management and staff are very friendly, professional and genuinenly care about thier residents. I have been very satisfied living in this community . i would highly recommend Big Oaks Apartments . Great...best location submitted by Josue V. - Mar 21, 2016 |Recommended: YesGreat area. . The property is nice the apartments are up to date..submitted by Shamero B. - Feb 04, 2016 |Recommended: YesIt's nice and worth the money..